The Impression Obsession team's challenge today is to create a birthday project! I had my Sloth Mail set out yesterday for my little house project, so I thought he ought to make an appearance. This set came out in a Valentine release, so it's got a little something for every occasion - with all its belated sentiments it's almost an excuse to just send cards late all the time! 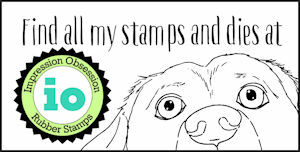 You can build your own sentiments, and add that little 'belated' stamp to any old sentiment - use it all year round! 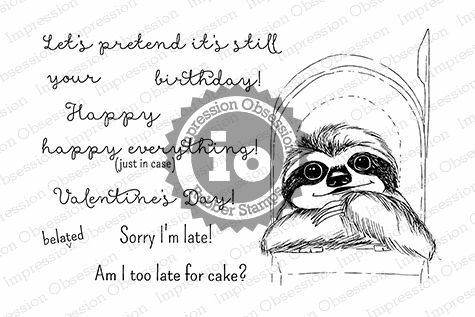 I love that little sloth, and you'll see him again soon in the summer release - he's been freed from the mailbox and he's ready to hang out wherever you want to stamp him. Then flipped it down and set it in place - you'll feel the stitching lines 'lock' in. I taped it in place, and then popped it into my die cutting machine - it just needs to cut the end, so just a quick in and out will do it. Here's a closer look at the results! Pretty easy to do... you could extend the length similarly with partial cutting too. I snuck in a Cover-a-Card strip there - I needed 'something' black and white there, and couldn't find any paper. Hmm and duh! This is CAC Screen. Wow! I absolutely LOVE that sweet sloth! Great birthday card! Thanks for the tip with the dies! Love this adorable card! What a cute card and I love that tip on how to get a shorter sentiment die cut. Dina, this is super cute. I love the mixing of the different fonts. I also love the different pattern mixing. This card is just lovely.